The natural choice of the people, it appears, is to learn the ancient classical language – Sanskrit. Chennai: Despite the opposition parties crying hoarse over Sanskrit imposition, the ground reality reflects the diametrically contradictory view. The natural choice of the people, it appears, is to learn the ancient classical language – Sanskrit. 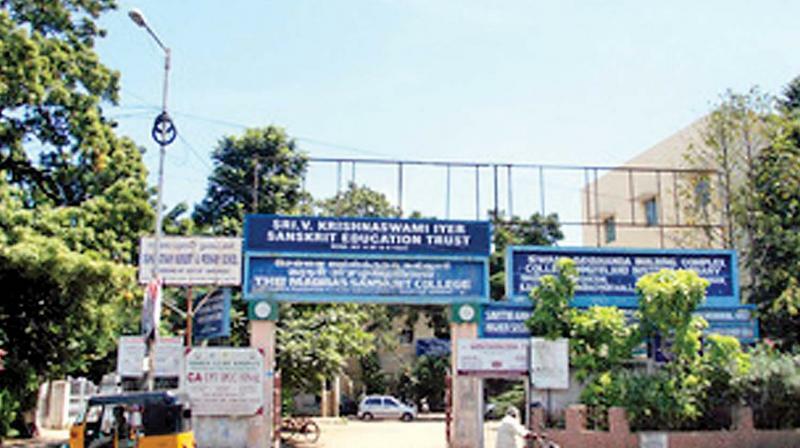 The 111-year-old Madras Sanskrit College launched its second digital course on Samskritam - Samskrta Praveshika –2 on World Sanskrit Day (observed on Oct.12) found increasing number of students. According to the Director for Digital Campus Hariharan C since the launch of the Digital Campus initiative of the Madras Sanskrit College in March 2017, so far about 5,000 enthusiasts registered for the course and close to 1,000 learners have enrolled for Samskrita Praveshika – 1, which is the basic course. “The Digital Campus membership is open to all and Sanskrit lovers can make use of the numerous features like lectures, livecasts, ebooks, etc.,” he said and thanked the trustee Ramesh Mahalingam for leading the digital initiative and their technology partner Classle which is powering the programme. Seetha Sundararaman, trustee, Madras Sanskrit College, introduced the second course and explained how it would benefit the students in forming sentences and also reading the Vedic texts. Suryanaraya Bhat, scholar from Karnataka spoke.